Yes, we are transformed. We couldn’t miss the fact in Houston, that we are a part of something bigger. Ambassadors look out from reality – and see life authentically. We were in the middle of it. We were an active part of it. Our lives participating in God’s life, changes everything. Each day in Houston we were reminded that we are part of something bigger through the words of Ephesians 2:8 “For by grace you have been saved through faith, and this is not your own doing; it is the gift of God;” which reminded us that as ambassadors in something bigger, we have a responsibility not so we can earn our way into something bigger. We’ve already been accepted as God’s beloved. So we respond with gratitude and become vessels of grace – pointing toward something bigger. I want all of you to know that our nine youth and four adults were AMAZING AMBASSADORS! 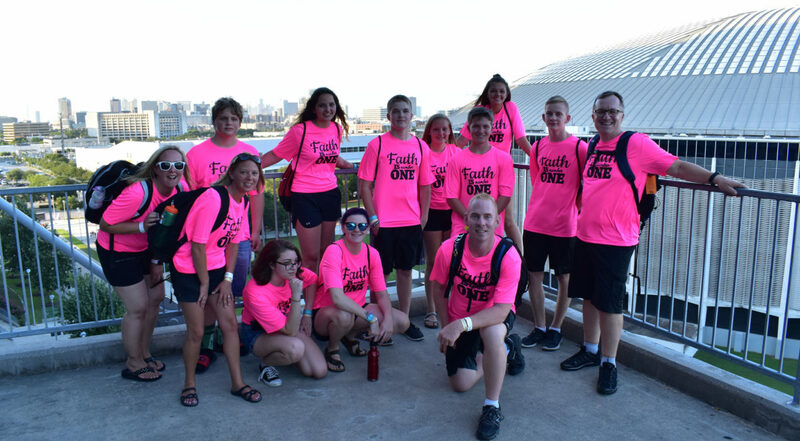 Whether we were in the back of NRG Stadium Wednesday evening or in the front row Thursday night; whether it was painting Riverside Methodist Church or anointing 750 people from the South Central Synod; your ambassadors welcomed the opportunity to step beyond their comfort zones to experience a joy of a lifetime. Well these amazing ambassadors who represented the people of Faith have great stories to tell and some of you heard their highlights in the message after they returned. Later in the fall we will give you a fuller expression of these transforming moments. Let me close with two God moments for me. The first was serving with team Faith anointing all of the people on Synod Day. You would have been so proud of our young people and adults at seven stations of water, dipping their finger in the water and tracing a cross on every brow saying: “You are God’s beloved child! (+) You belong!” Troy was closest to the front and anointed our new Bishop Vivian; as he put it, “with a little fear and trembling.” This stepping out to participate in the liturgy gave me goosebumps. The second memorable moment was when a mother named Jamie shared her daughter’s transgender journey. Then she introduced her beautiful eleven-year-old daughter, Rebecca, who lit up the stage with her smile and articulated a message how “God’s Hope Changes Everything!” Up on the screen flashed the remembrance of her baptism, back home, when her pastor renamed her Rebecca. God used this precious gift to tug on my heart and squeeze out loving tears of gratitude for the ELCA who welcomes all children. These are just a few tidbits of transforming moments. See more from Pastor Mark, Pastor Lisa, and all things Faith in the August Newsletter. And don’t forget to visit past newsletters and Faith’s calendar also.